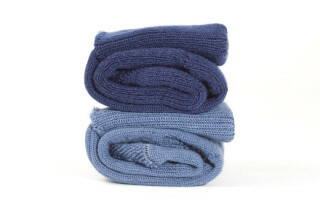 Home» Product Photography » Product Photography – Socks, Socks and More Socks! Product Photography – Socks, Socks and More Socks! Making Photos of Socks Interesting…! This is a product photography shoot for Queensland Hosiery Mill – they manufacture all kinds of socks right here on the Gold Coast. Who knew not everything was “made in China” these days? Rather than photograph the socks flat and boring, we used live models in groups and individually to bring some life to the products. The studio was a simple lighting set-up, just 3 strobes (also know as the auxiliary flashes that you mount on top of your camera’s “hot-shoe”). One strobe each side set up low on a light stand with a “short-through” umbrella (the white ones), and the third set directly in front on a mini-tripod with a diffuser on the flash. Also set up very low – 10cm off the ground. I use radio triggers to fire the flashes – you can buy these inexpensively from photographic equipment stores or online. They just take rechargeable batteries which you can also get from camera stores. I used a white paper backdrop, 3m wide. The studio shoot did require some post-processing to whiten the background a bit, but I needed to create some definition between the white socks and the white background – so some shadow was left in. To do this I just increased the exposure level in Photoshop on a duplicate of the RAW image and overlaid it with the original image and then “erased” the grey areas of white backdrop with the eraser tool. I’m sure there are other ways to do this too. We did also shoot some location images for the other banners for the website. Two boys playing soccer at a local park – and then walking towards me and away from me in the school socks. I set the camera to a fast shutter speed of 1/500th sec – and it was a bright sunny day so I had no trouble with exposure. I also got down to a low level to take the shots. The banner image for the work socks was taken outside the building, using a shallow depth of field to keep the attention on the socks and not the background. 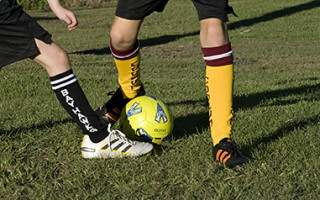 If you want to check out great quality, locally made socks for your school, sports club or business, you can see the product range at www.qhmill.com.au . The new images are not up on the site as I write this blog though.